There is a man who is not tall. He tells me about the course he is taking. “Flash fiction is a lot like the prose poem,” he says. “I’ve not written anything over 500 words. Every one counts.”I consider this. I sit down in a room. I try to write. “There is a man who is not tall,” I write. “Flash fiction,” I write.The diamond shapes sewn into the couch are different colors and people come in and out of the room. None of them are tall. “You are preoccupied with height,” they say.I am sitting where I know the man once sat. I say that I want to settle my body into where his body once was. The truth is, I want to settle my body into his. The truth is I want to settle my body. A tall woman comes in flipping pages. She stumbles over me. “Hi,” she says. I know by the way her toes sit together that she has been treated well by men, and I know by the way her eyes under her curly hair scan the page that these men and her mother have all told her she is beautiful. “I do not believe it,” say her legs, crossed, and her lips, pushing. I am going to ask the man one day, “Do you think I am beautiful?” He will stare a little, stutter, decide what to say (“I don’t know, I’ve never really thought about it”), but kiss me instead to discover his answer. It will be a quick, firm kiss, and in one moment we will both know I am not. “Does it have to have a plot?” I am asking him. “And flash nonfiction, does that exist?” What I mean to say is, every thing counts. What I mean is, every word. 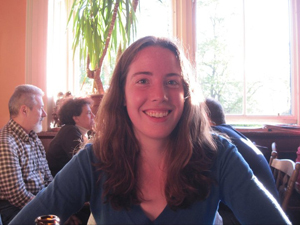 Elizabeth Cooley is a 2012 graduate of Knox College (in Galesburg, Illinois), where she majored in creative writing. In her senior year, she was poetry editor for Knox’s literary journal, Catch, where her work had previously appeared. She lives in Milwaukee, working with people with developmental disabilities and volunteering at Woodland Pattern, an independent bookstore that specializes in small press poetry.